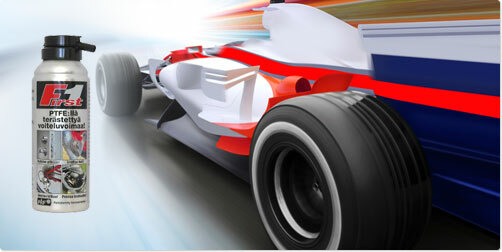 Taerosol PRF family of products offer a wide range of products to meet the needs of the electronic industry. The products combine very high quality, safety and environmental awareness. and PRF Liquid Line – excellent for other industries and maintenance. Product family includes nearly a hundred items for different purposes. These products are devided into three series: PRF Electronics is, as the name suggests, for electronics and everything related to electricity. 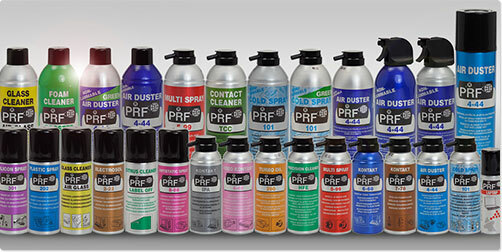 PRF For Industrial and PRF Liquid Line, on the other hand, serve excellently other maintenance and industrial needs. The product series consists of almost 100 products for various purposes. Taerosol is also constantly developing new products in co-operation with Taerosol’s customers. CAR EVI – The Power play of taking care of your car since 1966. 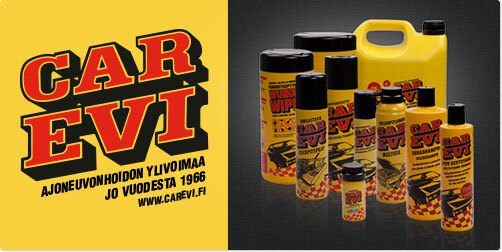 The legendary Finnish CAR EVI glass cleaner: Specially enhanced glass cleaner spray and the grand old product of the CAR EVI products since 1966. The family now also includes other new CAR EVI products! This multi-usage oil containing PTFE has mainly been the privilege of the professionals of care-taking and industry. The new FIRST1 spray oil is based on PRF Teflube oil which is now modified to consumers. The positive modifcations concerned consistency packages and price. Private Label Products – a high-quality addition to your company’s marketing. A part of Taerosol’s customers wish to have Taerosol’s high-quality products with their own brand and therefore advertise better their own company. Taerosol equips the products with labels, sales packages and cargo packages designed by the customer. 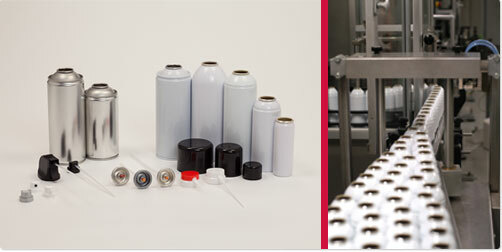 Naturally, Taerosol also provides help in achieving the best possible physical appearance for the labels and packages. Contact cleanser, removes oxide, sulfide, dirt, oil and resin. Non-conductive, especially for fitted contacts. Cleanser and lubricant for extremely sensitive contacts and electromechanical drives. Non-conductive. Special spray for cleaning of magnetic heads of video and cassette recorders. Not conductive. Cleanser for removing oil, greae, resin, oxide, dust and dirt. Does not affect metal, synthetic material, rubber, paint or varnish. Evaporates completly. Leaves a dry and clean surface. For adhesives or paint. Cold spray for tracing and localizing defects in semi-conductor circuits. Cools to -55°C. Active cleanser for cleaning of smooth surfaces like glass, plastic and paint coatings. Anti-static cleaning foam. Extremely suitable for claning the exterior of computers and televisions. Prevents dust attracting static charge build-up. Suitable for wood, metal, plastic and electrical appliances. Fast-drying protection enamel. For isolation of electrical circuits. Improved petroleum for lubricating and protecting against dust and corrosion. Universal spray for electrics, electronics and mechanics. Expels water. Lubricates and protects against corrosion and rust. A colourless cleanser and protection spray for shiny surfaces. Siliconspray can stand temperatures of -40°C to 315°C. A greasless lubricant for demanding use. Does not make filthy, and does not contain oil or grease. Bajol spray from lithium basis. Lubricant that protects against rust and corrosion. Possible to cover concealed areas with lubricant. Powerful claning foram for multifunctional usage. Removes dust and grease for glass, wood, metal etc. A rapidly vaporizing cleaning agent which leaves a greasless, clean and dry surface. Cleanes and removes grease, printing ink, glue stains and other dirt for metal, glass and ceramic surfaces (e.g. before painting or gluing).